You are here: Home / RECIPES / Breakfast / The Best Slow Cooker Apple Butter Recipe! A homemade Apple Butter recipe is exceedingly more flavorful, spiced, and rich than a store bought jar! Inspired by my grandma’s old fashioned apple butter recipe and the Cracker Barrel Apple Butter Recipe, this slow cooker apple butter recipe is easy to toss together with very limited work required and easily the best apple butter you’ve ever tasted! Whenever I think of homemade apple butter, I think of my grandma. My mom grew up on an orchard in the St. Louis area, and, even though it was sold long before I was born, my grandma would get a big batch of fresh fruit from old neighbors and make homemade jams and preserves. When we visited, we would often be sent back home with a couple jars of goodies – normally her peach jelly and apple butter. Before my grandma passed on a few years ago now, I took it upon myself to try to recreate her apple butter. Well, her old fashion apple butter recipe combined with the Cracker Barrel Apple Butter Recipe that my family also loves so much! She thought the end result was delicious and absolutely loved that this apple butter recipe was made in the slow cooker. She had always made it the long way with the oven and stove top, so using the crock pot was a genius idea to her! She always loved seeing how technology could make cooking easier over the years, including her peach jelly recipe that can be made in the microwave! Her apple butter was normally made from a red apple which is traditional, so the recipe down below is made from red Galas. I have plans on eventually tweaking the recipe slightly into a Granny Smith Apple Butter, which is something my grandma did occasionally. It was my sister Debbie’s favorite batch! My oldest sister, however, will always love Cracker Barrel’s apple butter though. The highest praise she has ever given my cooking is to say my slow cooker apple butter taste’s like the apple butter from Cracker Barrel! 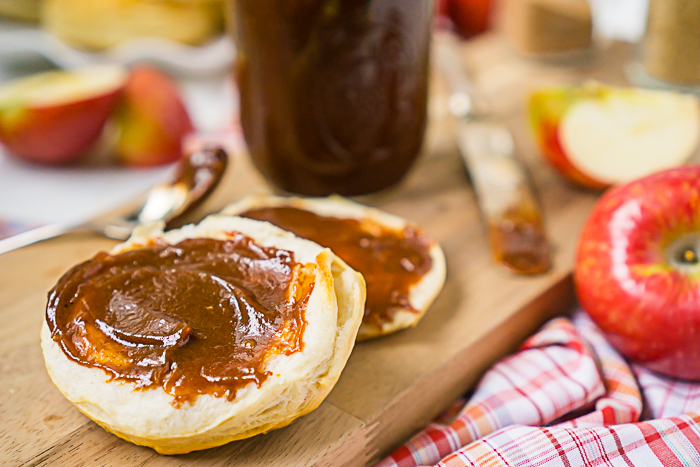 If you have never had apple butter before, you might be confused by the name. It’s not exactly the most descriptive title for this tasty treat that works well on toast, for baking, and even with main dishes like pork tenderloin. 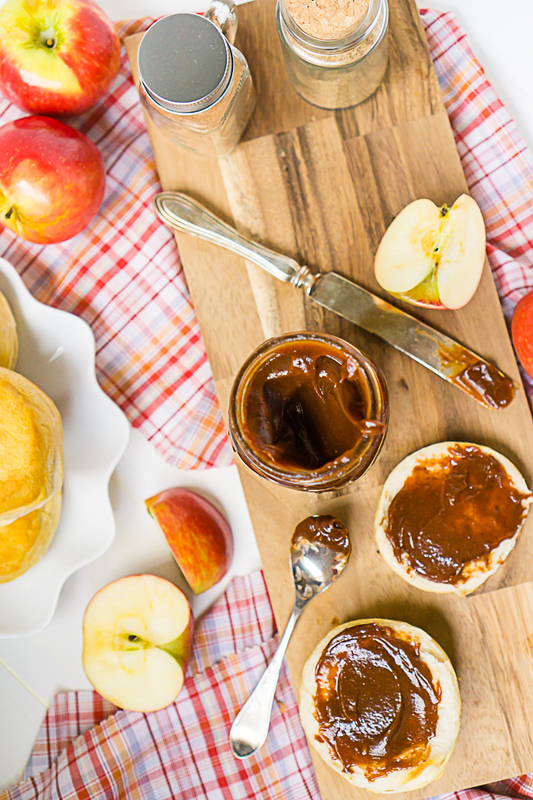 First – Apple butter is not apple-flavored butter. I know flavored butter seems to be all the rage lately, but this is not it. In fact, apple butter has not butter in it at all. The term butter refers only to the butter-like thick consistency and it’s common use as a spread on breads. Apple butter is a highly concentrated form of applesauce that’s super smooth and made by slow cooking apples with water or cider until the sugar in the apples caramelizes which is where apple butter gets its dark brown color. 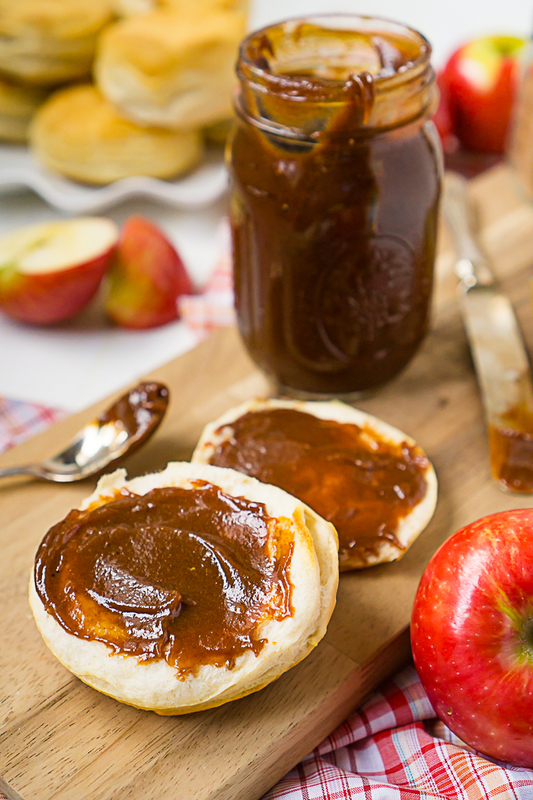 The concentration of the sugar also gives apple butter a longer shelf life than apple sauce. HOW TO USE APPLE BUTTER? If you’ve never had apple butter before, I always recommend trying for the first time on a warm fluffy biscuit! It’s the perfect combination! When or if you frequent a Cracker Barrel, you should definitely order the apple butter and biscuits; it’s a must for us! I also really love baking with apple butter because the spiced apple flavor pairs so well with breads and pastries. I use my homemade apple butter to make my Apple Roses which are always a big hit at Thanksgiving and special events. Consider even subbing out any other jelly or preserve with apple butter, such as crumb bars. Apple Butter can also be used with main dish recipes and is most commonly paired with pork! This is a recipe that takes cooking time in the slow cooker, but not a lot of prep or active cooking time on your end. The most time consuming portion on your end is peeling, coring and cutting your apples. An apple peeler and corer will make the process go even faster vs doing it by hand! When the apples are prepped, just add everything into the slow cooker and allow it to cook! WHAT APPLES ARE BEST FOR APPLE BUTTER? For apple butter, I normally rely on Gala while occasionally also adding in McIntosh, Red Delicious or Fuji. Realize some apples and even some batches are sweeter than others so you can adjust how much sugar you use based on how sweet your apple is. It’s easy to start with less sugar and add more later! Some people swear they get better flavor by mixing their apples. I’ve never found this to be true exactly but I’ve definitely used a mix before when I’ve had a mix of apples to use up before they go bad. For me, the distinct flavor of my apple butter comes from the use of cloves and allspice, which are not always commonly used in other recipes. Consistency of your apple butter will be a personal preference. As this is essentially a longer cooked apple sauce, your apple butter will most likely be slightly chunky after slow cooking all day. I prefer my apple butter to be smooth though, so you will notice I added in a step in the recipe to use an immersion blender to puree the apple butter. Before I owned an immersion blender, I would just put it through a classic blender. HOW DO YOU STORE HOMEMADE APPLE BUTTER? This is one of the most common question I get regarding my apple butter recipe, so I’m adding it’s own section. 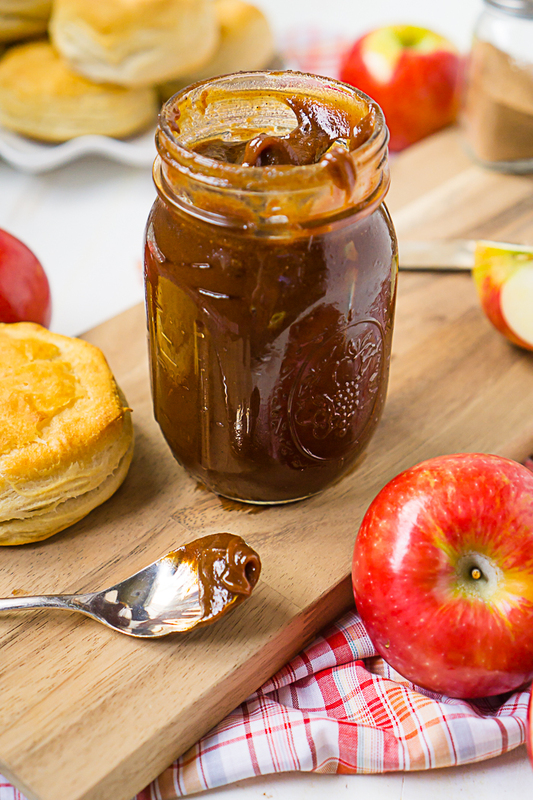 I personally add this apple butter to mason jars and keep in the fridge. It will stay good for a month and often longer! You can also freeze your extra apple butter until you are ready to use it. Just add to 1 cup freezer containers and pull them out when you finish your last container. Lastly, I have never canned apple butter or anything else before. However, my grandma did and you certainly can. You can check out Ball’s website for canning instructions. Again though – I have not tried it myself though so I cannot offer a guarantee on the process. Now It’s Time to Make the Best Apple Butter Recipe! How to Make the Best Homemade Apple Butter in your Slow Cooker - Flavorful, spiced, and incredibly rich! Inspired by the Cracker Barrel Apple Butter Recipe! Peel. core and chop your apples. Place all ingredients in your slow cooker and mix well, making sure all the apples are coated with the spices. If you can, I recommend cooking on high for the first four hours, stirring occasionally. Then switch the heat to low for the next 6-8 hours. If you won't be around, you can cook on low immediately for 10-12 hour. Most of the water should evaporate while cooking, and the mixture will thicken slightly. When your apples are well cooked and the liquid has mostly evaporated, insert immersion blender or add ingredients to blender in sections to combine and smooth your apple butter. REFRIGERATE or use proper canning methods. This batch fills about 3 regular size mason jars for me (3 pints or 6 cups). this is the best and easiest apple butter I will def use this recipe again. How many pint jars does one batch make? I made something very similar over Christmas holiday for my family. They loved it best yet is how eay it is to make! It is definitely easy to make with a crock pot! Back in the day, my grandma used to cook them down in the oven, which would take forever. This looks amazing! And I love that you can make it in the crock pot. I have some Macintosh apples calling my name. Just a thought. This looks totally yummy btw. I wonder if you could freeze it. You can definitely freeze it! I like to give my extra away, so I never have to worry about it, My friend puts the apple butter in small little jar and freezes the extras when she makes the recipe though. While I’ve grown up on apple butter, I have never tried it with PB and I am a huge PB fan as well. I will definitely have to try out the combo. Thank you for featuring my recipe! I really want to try this! I’m not a fan of jams or jellies but love apple butter!